An Omnicom for Eisner | Innovation, Inspiration... Atlas Unleashed! So there’s this debate happening in the comics industry centered around whether to go with digital presentation or remain dead tree editions. The whole term “dead tree” edition as a catch phrase is getting quite old, and it was meant to signify that on-line comics were soon to supplant printed editions. Since on-line comics have been around a decade, I guess they haven’t done that yet. What is intriguing is that the analogy of radio and television technology applies here. It was thought that television would supplant radio and that radio would cease to exist (this was the common thought process during the 1950’s-1960’s). Yes, television did in fact take over, but radio is still with us today… and even today, radio has reinvented itself through internet radio and podcasting. Digital presentation is the same basic idea, but revolutionized for a new age. So the arguments that print is dead, or that digital comics will never catch on are both wrong. I’ve related to many friends that my reasoning for purchasing an iPhone is my personal homage to the Legion of Super-Heroes. During the 1980s the Legion used hand-held devices that were similar to devices used on Star Trek like a Tricorder, a communicator, and a gigaflop portable computer. The device in the Legion’s stories was called an “Omnicom”, because you could do virtually anything with it… and you could program it to do whatever it couldn’t do at that moment. Essentially, it was the 1980s version of an open-source upgradable translator and communicator. 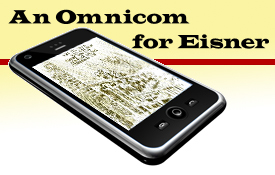 The “-com” part of “Omnicom” is all about communication. If you look at what Print is, it’s also about communication. Magazines that are stored as portable documents (PDF)s are about communication. A translation app is about communication. Music, poetry, instruction manuals, religious texts, newspapers, video tutorials are all about communication, too. Even the root basis of all STORY is about communication. We live vicariously through the related actions of others and learn something new about the values and consequences of those actions through that STORY. A modern age “Omnicom” has been invented and it’s been received as a revolutionary device. How can I say that? Well all the cellular manufacturers are straining to create their version of a “smart-phone” or again as I like to label it… “an open-source upgradable translator and communicator”. Omnicom or iPhone, there’s damn little difference. So even if you don’t want the Apple brand there’s a second generation Kindle device from Amazon, the Palm Pre, Google’s new line of Android smart-phones, the BlackBerry Storm, or Samsung’s Omni (there’s that reference again). And it won’t stop there… these devices are making it possible to communicate in multiple different ways and formats as we keep demanding more mobility coupled with greater connectivity. The natural outgrowth of this is deconstructing our comics as animatics (panel-by-panel storytelling) and using this new format (2.5”wide x 2”high) for a new storytelling experience. We lose the page layout and page design, but gain a new rhythm to the story, one where each frame can have massive impact, or be sedate and calm. So it’s the design within that frame and the subsequent placement with the following frames that will move the story along. iComics, as I like to call them, gain elements from cinema, and discard the page design elements while focusing us on the contents of the frame (or view-screen). I can tell you that there are several great examples of superlative use of this new format. IDW’s new Star Trek: Countdown series understands this quite well. Other iComics are great stories with a failing grade in the production delivery. One major gripe is the differing size of text within view-screen frames. While Will Eisner taught us that different text sizes refer to the volume level that words are spoken at, that point seems lost here on some iComics production departments. Infinitely small text is quite hard to read, and storytelling tradition tells us that small text is read as a whisper (it’s not about the eye-strain). This storytelling technique is used properly in UClick’s iPhone app of Vampire Hunter D. It’s also on display in the iComic versions of Jeff Smith’s Bone. I could name 12 other instances where the better part of valor is not to say bad things about poor product… and so I won’t. Friends of mine know that I refer to the current advent of iComics as Day One, Year One of the iComic. Essentially, the first few years of the newspaper cartoons of the Yellow Kid except in a new format for a new millennium. It’s a start, and as it will take a Master to fully captive readers/audiences of iComics, I have great hope for that to happen. The threshold for me was realizing that a true masterpiece has been ported over to an iComic app. It’s there for those who want to brave the experience (from Genus Corp), and currently I’m waiting a bit. What masterpiece of comics storytelling am I talking about? Why nothing less than Will Eisner’s A Contact with God!